Vista Cay 5 Star Resort! Packed with amenities. Near Disney & Convention Ctr. 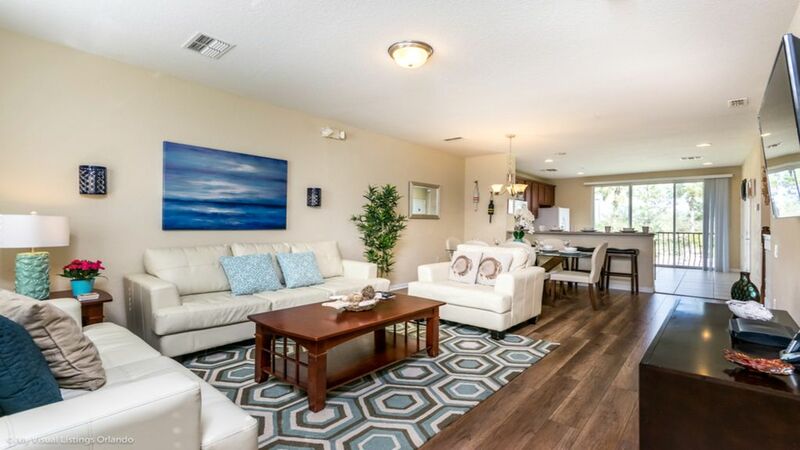 This Newly fully furnished and decorated tri-level townhouse with approx. 1800 square feet offers three En-Suite bedrooms, three and a half bathrooms. The second floor has a half bath, fully applianced cherry cabinet kitchen with corian counter tops, the living room is furnished with off white leather sleep sofa, love seat and chair, and dining area with a full size glass top dining table large enough to seat six. our bar stools at kitchen counter. The living room boasts a 55” 1080P Flat Screen TV with movie & sports channels along with hardwood floors installed 2017. Just minutes from everything. Disney World, SeaWorld, Universal Studios and the Orange County Convention Center are just minutes from Vista Vacation Rentals. Plus you'll have three swimming pools and hot tubs, a beautiful 72-par public golf course across the street, a full grocery store within walking distance, and the famous shopping and dining experiences along International Drive. Yes, Vista Cay Resort has everything you need for the perfect Florida vacation. Each bedroom has private bath. The townhouse was comfortable, clean and nicely furnished. Location was excellent and centrally located for all our activities. Owner was easy to deal with and made our stay hassle free. We have been renting in Orlando for the past five years for our golf weekends. This was the easiest for check-in and out as well as the most comfortable property for our group. We would love to rent here again next year. Thank you! We had two families with a teen each that were playing volleyball at the convention center. The bedroom with two full beds with its own bath was perfect. The top floor tubs do drain slow but didn’t cause an issue. Beds were cozy, pillows a little thin. You get some white noise from cars but nothing that would stop us from coming back., we slept well. Getting in and out of the property and condo we used a key code which we loved. Also liked the designated parking spot right in front of the door. It was perfectly located by the convention center, closer than the rest of the team. Food and entertainment was just up the street off international. Washer and dryer worked great, we did some light cooking and had all we needed. Felt wierd using the pretty bowls on the table but they were a perfect size. Publix, Walgreens, and some small food stores are right around the corner. The weather was cold so we didn’t use much of the property. We went to universal studios and it was very easy to get to and close by. We had a blast at the Sugar factory. Tv in the family room was a bit of a challenge to get cable on but all the channnels you need. Wish list would be a cooler to borrow and some cards and board games so bring your own! Owners were great to work with and responded when I had a question. We may have to be back in June and would definitely see if this property is available. Resort was perfect for our vacation. Clean, spacious, easy access to Disney and Sea World. Beautiful property, wonderful experience. I may never stay in a hotel again. The resort is located near the convention center and within close distance to nearby stores and restaurants. The fitness center and pool were wonderful. The house was well maintained and a delight to stay in. the rooms and decor were as pictured, clean, modern, spacious. Everything about the stay was low maintenance. It was home away from home, worth every minute and so valuable for the cost. Disney World, SeaWorld, Universal Studios and the Orange County Convention Center are just minutes from Vista Cay Resort.